If you're a big fan of surf, snowboard, and skateboard games on the iPad, and want to take your gaming experience to the next level, the Apstik might be what you’re looking for. 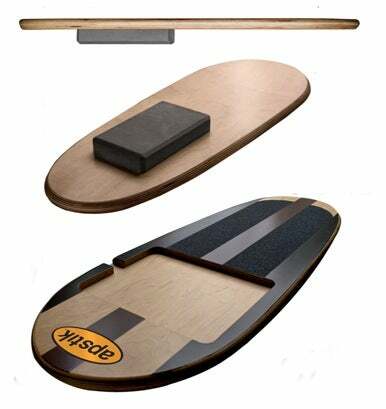 It’s a laminated 12-by-32-inch wood platform mounted on a dense foam pad that lets you operate your iPad surf, snowboard, and skateboard games with your feet. Simply place your iPad in the board’s indented mounting area, stand on the board and lean in the direction you want your character to move, and the iPad’s accelerometer will do the rest. While this is certainly a novel idea, I wonder how comfortable it would be to play a game standing up while looking down the entire time. Fortunately, there appears to be space for you to plug a VGA cable into your iPad’s port so you could watch your game on a display in front of you, which could make things more enjoyable. Another consideration: since the iPad must be placed on the board, its touch controls will be inaccessible, limiting you to games that rely solely on accelerometer control. Apstik’s creator recommends games such as Traction Games’ Pro Surfing, Ubisoft’s Shaun White Snowboard, and Golden Hammer Software’s Big Mountain Snowboarding for use with the board. Tony Hawk Pro Skater 2 will also work, but is limited to turning, since tricks are executed via touch control. The Apstik sells for $148, so only the most avid iPad boarders should consider it. But if you're still not sure if the Apstick is right for you, maybe this video of it in action will sway you. Surf your app, indeed.